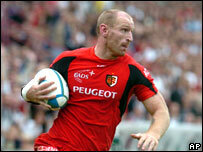 Wales rugby captain Gareth Thomas has been found guilty of assault by a court in Pau, south-western France. Thomas, ex-Bridgend team-mates Phil Booth and Andy Moore and coach Richard Webster were accused of violent affray at a nightclub after a game in 2002. Booth was guilty of sexual assault and assault and given a six-month suspended sentence. Moore was also guilty of assault, and the three were told to pay 16,000 euros (£10,700) compensation. Mr Webster was cleared of all charges. At an earlier hearing, the court was told that the players went to the El Barrio nightclub in Lescar after losing to French club Pau in a Parker Pen Cup clash, and had been drinking heavily. Booth was said to have drunkenly exhibited himself while standing on the bar in the club before being pulled down by his team-mates. He was accused of sexual exhibitionism and sexual aggression towards 25-year-old Celine Arnaud, who was at the club with her boyfriend Jean-Michel Gonthier. Booth was then said to have pursued Miss Arnaud during the evening. Mr Gonthier, 27, told the court he was so fearful of Booth that he decided to leave with his friends. He said he and Miss Arnaud were attacked by the players as they tried to leave the club. Mr Gonthier said he was thrown down a flight of stairs by Booth and was then kicked and beaten. Both Thomas and former Wales second row Moore were said to have taken part in the ensuing brawl in which team-mates were so drunk they hit each other. Ms Arnaud was also repeatedly punched when she tried to intervene. Thomas had said that he saw Mr Gonthier strike Booth first, and claimed not to have thrown any punches. As captain of Bridgend at the time, he said he felt a responsibility to hold Mr Gonthier to ensure he was there when the police arrived. He said he touched Mr Gonthier on the shoulder and pursued him when he went outside only to ensure he was present later on. The court heard that Miss Arnaud was injured and traumatised by the attack and was off work for 15 days, while her boyfriend was unable to work for 11 days. In making their judgment on Thursday, the magistrates made it clear that they believed the French couple's version of events. Thomas, 31, and former Wales second-row Andy Moore were each fined £1,000 and ordered to pay £1,900 compensation to the two victims. Booth was given a six-month suspended sentence, fined £2,000 and ordered to pay £3,000 compensation. Defence lawyer Jean-Paul Brin said he was satisfied with the outcome. He added: "The severity of the sentence is much more modest than what was asked for at the hearing last month and is well balanced. "The compensation which they have been ordered to pay is also well below what was being demanded. "The magistrates have listened to my argument, particularly with regard to Webster, who has been proved innocent, and have acknowledged that their misdemeanours were less severe than was being claimed. "They had a small drink, made a mistake and have been held accountable for that." Thomas, who captained Wales to the 2005 Grand Slam and skippered the Welsh side against New Zealand in Cardiff last Saturday, now plays for French champions Toulouse. Mr Webster, then a coach with Bridgend, is now the forwards coach with the Cardiff Blues regional side. Booth, who is now retired, played for Llanelli last season, while Moore retired in 2004 due to a neck injury. Thomas, Booth and Moore have 10 days to appeal. None of the four defendants was in court in Pau on Thursday to hear judgment passed on the case.